Secret, the anonymous sharing app developed by David Byttow and Chrys Bader-Wechseler, looks to be on its way to resurrection. The app was part of a wave of anonymous apps like Whisper and YikYak but shut down April 2015 after facing a lot of criticism over privacy and cyberbullying. Secret allowed anyone to post snippets of text like a rumor or piece of gossip on an anonymous basis. Many of these texts contained detailed information only certain individuals would know and, though one’s name wouldn’t appear next to their post, other details like their location might show up, making it easier to deduce who leaked the information. But the startup behind the app really unraveled when several key team members, including Bader-Wechseler, abruptly left the company. Though Secret had raised $35 million, it had cut its staff in half and sources close to TechCrunch confirmed it was basically in maintenance mode before stopping altogether. Byttow spoke with us immediately after about that cryptic post and tells us the recent presidential election has emboldened him to bring the app back. “The downsides of current social media products MUST be addressed, and this is currently the way that I know how,” Byttow told TechCrunch. Social media played a big role in this election — President-elect Donald Trump credited it for pushing him over the top for the win — and Facebook, in particular, has been accused of spreading fake news and misinformation to unsuspecting citizens throughout the election cycle, thus impacting the outcome of the election. Some also say social media is to blame for presenting biased news, thus further dividing our nation and widening the canyon between conservative and liberal ideologies, something Byttow wishes to address in the new Secret. Though Byttow says he is “treading lightly” and wants to build the right thing this second time around — starting by talking to a lot of people to get it right. He also added that if and when he does release the new and improved version he wouldn’t be doing it for the money. He says he’d go it alone instead of taking VC investments this time and that any money made by the app would go largely to charities he believes in such as the ACLU and Planned Parenthood, which has been threatened under a Trump presidency. “If it’s to exist, it must be self-sustainable, and it must be free of any conflicts of interest,” he said. While Byttow didn’t want to elaborate for us just how the app would generate an income or come together without investment, one can assume he’ll bootstrap the business based on other endeavors. Byttow currently runs an enterprise content startup called Bold. But he says his main priority is and will remain Bold and that the new Secret would not be his handy work, but would be built by another team under his supervision. 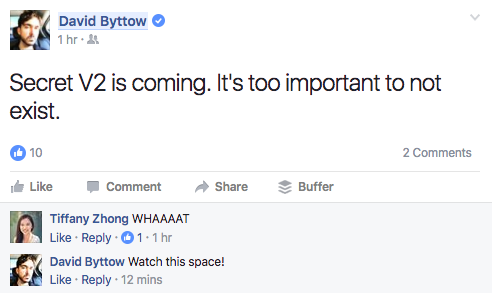 “One thing I know for sure: It’s going to be good,” Byttow added. We’ll be sure to let you know when we hear of a more concrete timeframe for Secret’s comeback. In the meantime, we’ll just have to post openly as our deplorable selves on social media.